Saigon, pretty nice town for a long weekend. Not as charming as Hanoi by a long shot, but still interesting with great food. Ellen lived in Saigon for a year in the early 70's as her Dad had a business there. She has many memories, mostly good but more than a few unique to a country in the throes of war. We picked the Park Hyatt over the Caravelle or the Rex; the still standing foreign correspondents hang outs. They are both wonderful, still adorned with that over the top 70's look that adds tacky to flashy. But, the Hyatt is a nice place, right in the centre of town. Now to the food. Ellen had searched out where Anthony Bourdain had 'Pho' that he raved about. We found The Lunch Lady (Nguyen Thi Thnah) by the river and it was wonderful, although, not looking like the most hygienic spot we've run into in Asia. No after effects. The Vietnamese people are, in our view, the nicest in Asia. Always with a smile and not the least bit shy or standoffish. And, they are tough as nails. We went out to the 'Cu Chi Tunnels'; the hand dug underground network that stretched over 200 km's, in all directions, from the Ho Chi Minh Trail in Laos, right to the Saigon airport. Started during the war with the French, only big enough for someone the size of a 10 year old, they had hidden bunkers for armaments, hospitals, etc. with up to 16,000 people living underground during the war with the Americans. And, everybody knew they were there but couldn't get to them they were so well planned and intricate. You can go down into them now (they have been widened in places for larger North American butts) but they are still tiny, damp, smelly and we wanted no part of that experience. 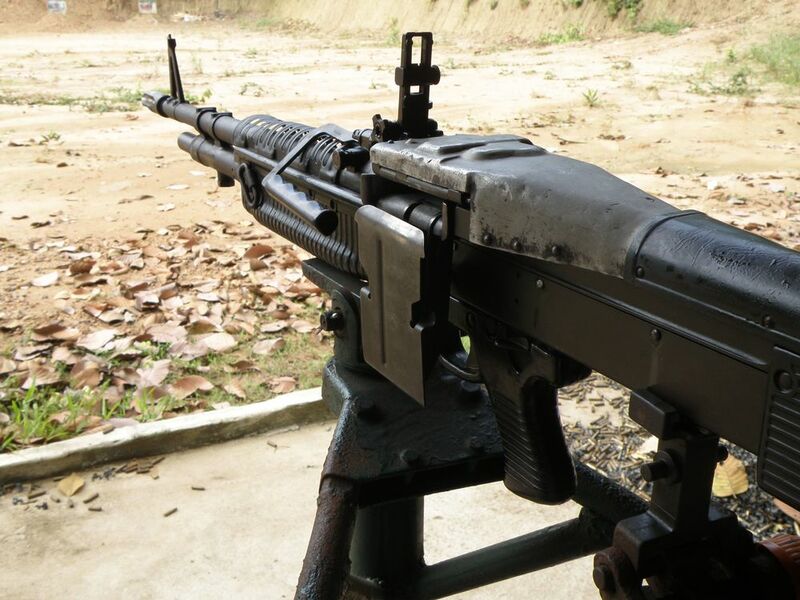 I did go and shoot a monstrous captured American M60 machine gun that got so hot at full automatic, the barrel would melt. The fire team was given extra barrels and oven mitts to change them. No wonder the Vietnamese won. And, I went to the War Remnants Museum. Very tough experience , particularly the Agent Orange displays with very disturbing photos of what pure dioxin can do to people. The place is clearly biased but I am told they have toned down the rhetoric a bit in recent years. Outside I was pigeonholed by a guy with no arms selling books. He was so intent on continually shaking my hand with his stump that I had to get away and just bought the damn book. Later I saw the same book in the official store for 1/3rd the price. Ho Chi Minh ( or Saigon if you prefer ) is a nice enough town but the war really drags you in, much more so than in Hanoi. If you had to do one, do Hanoi.